Corita Kent was the pop art nun. 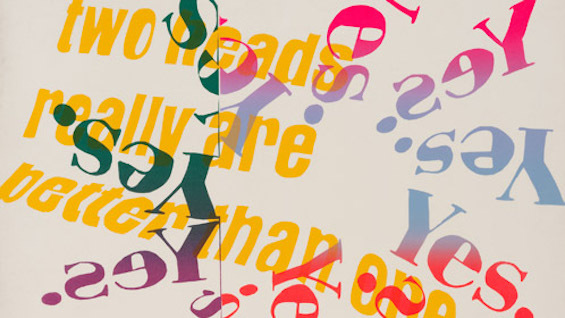 Combining headlines torn from magazine advertisements with handwritten song lyrics, poetry, and scripture, her vibrant silkscreen prints reflect her faith and the turbulent politics of the 1960s. Join us on the eve of what would have been her 100th birthday as we delve into her life and work, looking at some of the original source material, hearing more about her teaching, and seeing a wide range of her prolific output. As theologian and friend Harvey Cox noted, “She could pass her hands over the commonest of the everyday, the superficial, the oh-so-ordinary, and make it a vehicle of the luminous, the only, and the hope-filled. Get tickets here. Barbara Glauber founded the design studio Heavy Meta in 1990. The studio focuses on projects for cultural institutions, collaborating with artists, curators, and editors to create monographs, interdisciplinary exhibitions, information graphics, and identities. Barbara has an MFA from CalArts and teaches design at Yale and Cooper Union. She designed the 2013 book Someday is Now: the Art of Corita Kent.